OMG! Sin-chan! Your my hero! XD i loved this scan! but since i can't vector to even save y life, this brightened my day straight! XD can't stop staring at it! Keep up your good work! I'm glad that I was waiting to see this wallpaper~ It's really nice! I can't say much for it's too perfect! look at how many comments this already got, i dont understand how i havent seen it until noww. i feel so late! oh my god! this is truly a masterpiece! i really love it! the background looks so awesome...so real...and the vector is neat and clean...just perfect! the details are really awesome! ...boa i just have to love it! OMG, it`s that scan. I wanted someone to vector it cause I was afraid of it. I have no courage to vector tough scan. -.-"
You never cease amaze me at your vector. The way you shaded the clothing is the best. I can`t believe you vectored such a crazy scan since it was pretty blurry to me. The background is really nice. You painting is always wonderful. I love the stones. I love how it`s snowing. Oh my goodness this wallpaper blew me away when I full viewed it. I honestly thought it was just a cleaned scan but it appealed to me anyway so I simply had to have a closer look, thank goodness I did. What a great work, the vector is flawless and the concept is perfect. Lovely colors and a spectacular wallpaper all around. Thank you so much for sharing this! Waaaaa! Sinever-san! I love it! I love this work! XD Yuuki & Zero... I am so happy for this... Your job, as always, is amazing. The vector is clean and elegant, like the background, too. Snow's effect is great, and I really like Zero's expression face. Damn Sin-chan, I just don't know how can you color in such an amazing way *___* I need to know. As it has been already mentioned, your vector looks just like a manga page. It's gorgeous! The background is very well done, it fits perfectly with the vector. Why do you think Zero's body is weird? You did a wonderful job, I like face's expression and the atmosphere you were able to creata in such a gorgeous way! OMG very high quality vector! love the hair the color just like the real scan! I love you sin! this looks soo great and you did a perfect job! Congrats on the elite you deserved it asolutely! 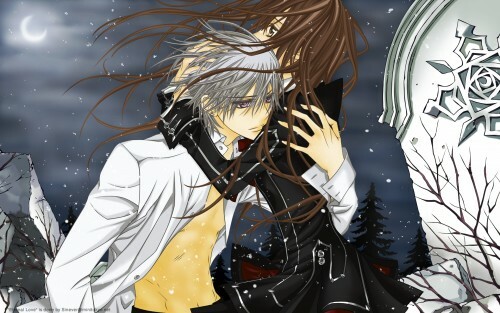 Aw.. Yuki and Zero, they could never be separate.. I must say Zero is the most outstanding in this wallie. His hair is so beautiful and I love his face to top. Hm.. his lower part is a no-no but overall this is a good wall. Thank you for sharing this with us.